A lot of people think the worst movie in Matthew Broderick's career was Godzilla - just a few days ago, I'd have said so myself - but I really think Deck the Halls might claim the prize. I've seen worse holiday movies this year, but I can't remember the last time I watched anything this vapid and idiotic. The movie is supposed to be a comedy, which means it's supposed to be funny. It's not. At all. It is, however, structured like a comedy, as if someone set out with a checklist and systematically crossed items off a list. New neighbors: check. Rivalry based on male ego: check. Obligatory gross-out sight gag: check. Car destroyed: check. House destroyed: check. Dream fulfilled: check. The wives are loving, loyal, and level-headed, but somehow unable to perceive anything in the world around them. The kids are two-dimensional jokes. There are cheap attempts at slapstick to placate kids and Kristen Chenoweth's cleavage to placate their fathers. My faith in our species was somewhat rekindled when Wikipedia confirmed the movie was a financial flop: real audiences, apparently, are smarter than the cynical producers of this film believed. None of these elements are strung together with anything approaching narrative cohesion, nor do the characters ever behave in a manner resembling actual humans. Broderick behaves like he's in a cartoon: to be fair, I'm not sure how else he could have approached this role. Danny DeVito attempts to inject some pathos into his character, but he's got nothing to work with so it comes out even more awkward. 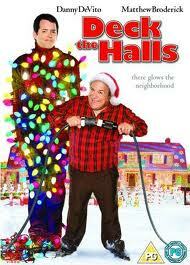 The real "star" of the movie, however, are the lights DeVito's character strings up on his house. Eh - I've seen better on YouTube. Jingle All the Way wasn't a particularly high bar for a Christmas movie about male aggression, and the fact Deck the Halls fails miserably to measure up doesn't speak well for its creators. Needless to say, you shouldn't waste your time watching this. The excerpts on Rotten Tomatoes explaining why it's at 6% fresh are far more enlightening and fun than the movie itself. Six percent seems a little high, though.